An undated photograph of Ciham Ali Abdu. Ciham is believed to be imprisoned in Eritrea. She was last seen in 2012. Ciham Ali Abdu has brown eyes and a broad smile. As a teenager, she found inspiration in art, fashion and language. 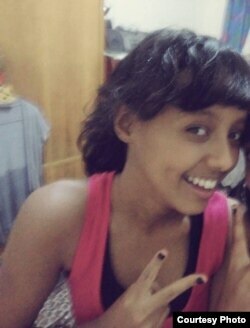 Growing up in Asmara, Eritrea, she enjoyed time with friends, music and swimming. Ciham Ali Abdu was born in Los Angeles, California, and grew up in Eritrea. As a child, she enjoyed swimming, fashion and music. Her father, Ali Abdu Ahmed, was a high-ranking government official and trusted confidant to President Isaias Afwerki. 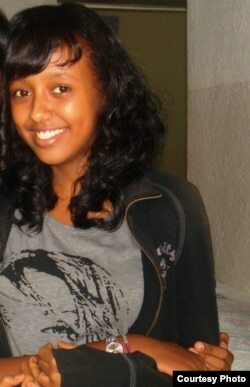 In 2012, when Ciham was 15, her father was Eritrea’s information minister. He shared updates about the country with the world and articulated key policy points. After her father, the information minister, fled Eritrea, 15-year-old Ciham attempted to cross the border into Sudan. Authorities apprehended her, and she hasn’t been seen since. Six years later, they have heard nothing. 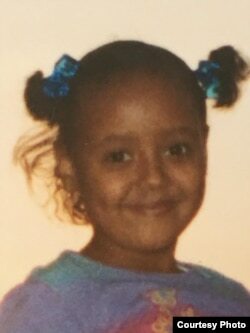 The Eritrean government refuses to acknowledge Ciham’s American citizenship — or her mere existence. The U.S. government has been similarly non-committal, acknowledging only that they have seen “reports” about Ciham’s case. Ciham’s family believes the Eritrean government won’t release her without outside pressure. But the U.S. forfeited a major bargaining chip when U.N. sanctions were lifted without preconditions, Saleh said. “I don’t understand how the U.S. gave up its sole leverage — sanctions — unilaterally, without demanding to know the whereabouts not just of Ciham Ali but its embassy employees.” Those employees have been missing even longer, Saleh added. But the United States could still push for answers, he said, through its relationships with countries that influence Eritrea — Ethiopia, Saudi Arabia, the United Arab Emirates. “[The U.S.] should consistently raise this issue just as it would if, say, an American religious leader was to disappear,” Saleh said. Neither arbitrary arrest nor indefinite detention is uncommon in Eritrea, where the government treats dissent and perceived threats to its authority with swift, harsh justice. In a 2016 report, a United Nations commission of inquiry concluded that dissidents face systemic torture, enslavement and reprisals against family members. Ciham is one of many prisoners in Eritrea, along with journalists and political figures, who have been jailed without charges or a trial. What makes Ciham’s case unique is the complete lack of information about her whereabouts or well-being. But Ciham’s case is unique, Saleh said, because no reliable information about her whereabouts or well-being has emerged. The rare communications the family receives from regime loyalists and unknown messengers involve upsetting details about what has happened to Ciham, but Saleh said it’s impossible to separate what might be legitimate from what he called “sadistic” messages designed to further punish Ciham’s loved ones. Ahead of a high-level U.S. delegation to Asmara led by Assistant Secretary of State for African Affairs Tibor Nagy earlier this week, the international rights group Amnesty International called on the United States to request the release of Ciham and other prisoners detained without trial or legal representation. “We are demanding that the U.S. envoy shall prioritize human rights, and shall not leave human rights concerns as expendable when dealing with political interests with the Eritrean government,” Fisseha Tekle, a human rights researcher with Amnesty International, told VOA. Recent diplomatic advancements in the Horn of Africa might create new opportunities to push for Ciham’s release. So far, though, neither the U.S. nor Eritrean government has commented on her case. “Assistant Secretary Nagy must make robust representations to push for the immediate and unconditional release of both Ciham and all those detained across the country solely for peacefully exercising their human rights,” said Joan Nyanyuki, Amnesty International’s director for East Africa, the Horn and the Great Lakes. Fisseha underscored that Amnesty’s concerns extend beyond Ciham. “Including Ciham, there are so many people who have been arrested without trial, without charge, for so many years, and the condition of their arrest — it’s not even known,” he said. On a conference call for media Thursday, Nagy didn’t address Ciham’s case, and neither the U.S. nor the Eritrean government responded to interview requests for this story. With no leads to follow or diplomatic breakthroughs to draw hope from, Ciham’s family can, for now, only find comfort in their memories, and a collection of photographs that depict an innocent girl unaware of the upheaval that would soon engulf her.